Human beings have known for millennia the importance of keeping teeth clean. Although we've only come to more fully understand dental plaque's role in dental disease in the last century, our ancestors seemed to know instinctively this gritty biofilm on teeth had to go. People from the past once used a variety of substances like ground oyster shells or leftover fire ashes to remove plaque from their teeth. Today, most of the world has replaced these substances with toothpaste, a mainstay of daily oral hygiene. So, why is toothpaste better than other substances used in the ancient past? Besides the many other ingredients found in the typical tube of toothpaste, here are the top 3 that make it the ultimate tooth cleaner. Abrasives. While your toothbrush does most of the mechanical work loosening plaque, toothpaste has ingredients called abrasives that give an added boost to your brushing action. The ideal abrasive is strong enough to remove plaque, but not enough to damage tooth enamel. If you look at your toothpaste's ingredient list, you'll probably see an abrasive like hydrated silica (made from sand), hydrated alumina, calcium carbonate or dicalcium phosphates. Detergents. Your toothpaste's foaming action is a sign of a detergent, which helps loosen and break down non-soluble (not dissolvable with plain water) food substances. While similar to what you may use to wash your clothes or dishes, toothpaste detergents are much milder, the most common being sodium lauryl sulfate found in many cosmetic items. If you have frequent canker sores, though, sodium lauryl sulfate can cause irritation, so look for a toothpaste with a different detergent. Fluoride. The enamel strengthening power of fluoride was one of the greatest discoveries in dental care history. Although not all toothpastes contain it, choosing one with fluoride can improve your enamel health and help protect you from tooth decay. 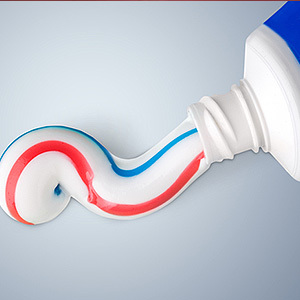 These and other ingredients like binders, preservatives and flavorings, all go in to make toothpaste the teeth-cleaning, disease-fighting product we've all come to depend upon. Used as part of daily oral hygiene, toothpaste can help brighten and freshen your smile, and keep your teeth and gums healthy.